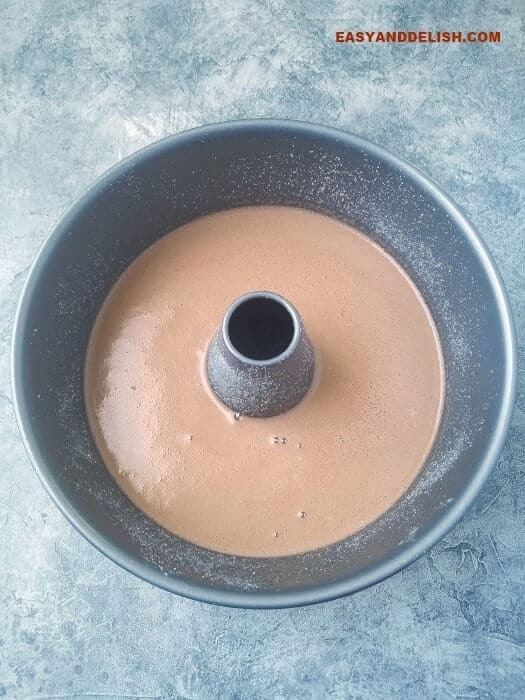 Brigadeirao is an easy family-size chocolate fudge flan made in the blender and baked in 40 minutes. It’s gluten-free, rich, fudgy, and addictive!!! 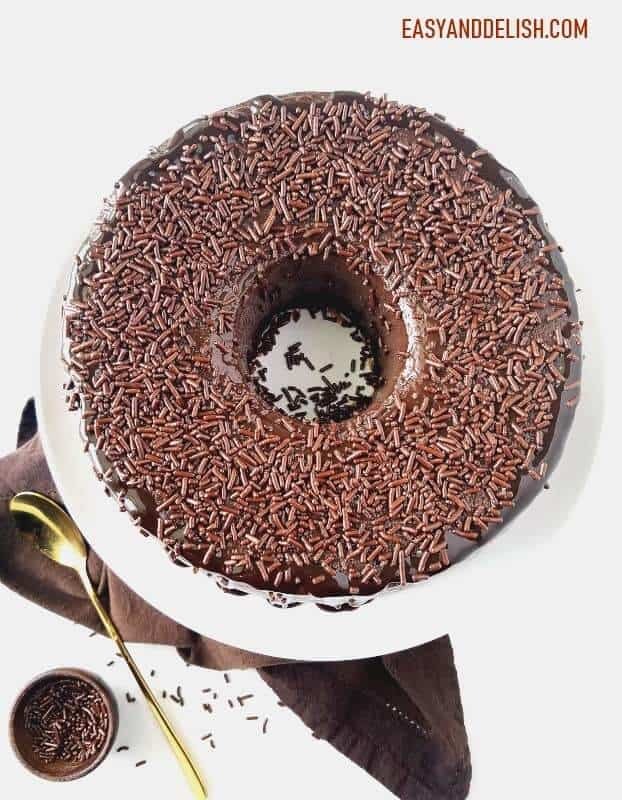 If brigadeiro is THE THING, just imagine a brigadeirão — a family-size brigadeiro. When I told one of my daughters that I was going to make brigadeirao, her face totally lit up. I have to confess — mine did, too! It’s fudgy and so addictive! On top of that, it’s easy to prepare. All we have to do is to blend a few ingredients in the blender and then bake in a ring pan for about 40 minutes. It requires no special cooking skills, yet is a hit among people of all ages. The secret is in the quality of the cocoa powder that you use and of course, in being careful not to overbake it. And that’s all! Well are you ready for your new fave dessert? Preheat the oven to 350º F (180º C). Grease a 8-inch (20 cm) ring pan with butter or cooking spray. Sprinkle sugar all over; set aside. Blend all ingredients (except the sprinkles.) in a blender until smooth. Pour mixture into the prepared pan. Bake in a bain-Marie for about 40 minutes. Remove from the oven, run a knife the edge around carefully, and place on a rack to cool. Remove from the oven, run a knife around the edge gently, and place on a rack to cool. Then, cover and refrigerate for about at least 4 hours, or until chilled and set. Last, run a knife around again and invert onto a plate. You may have to tap bottom of the pan to encourage unmolding. Serve chilled with chocolate sprinkles on top. 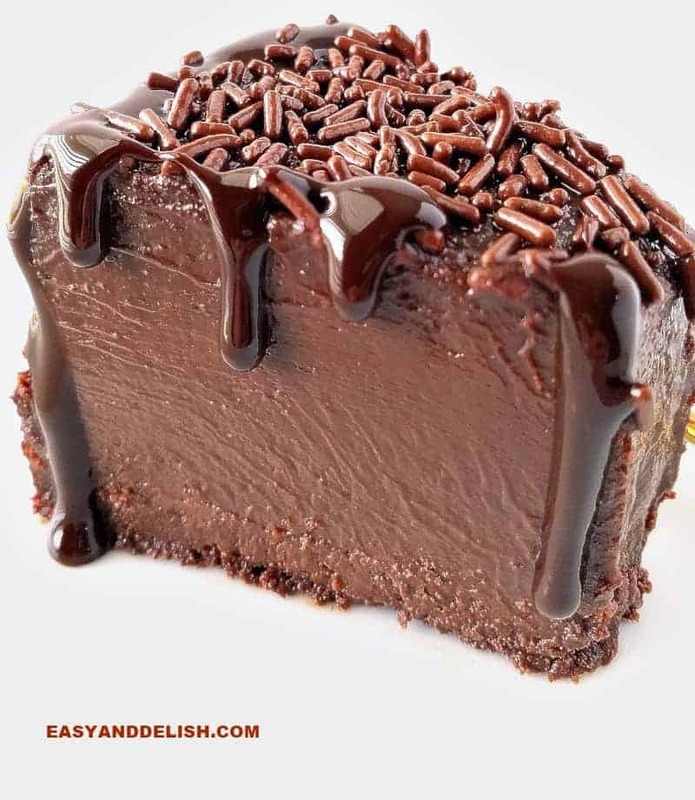 If desired, drizzle chocolate fudge on the edges. For a vegan brigadeirao recipe, click here. Bain-marie (or Mary’s Bath) is the French term for a ‘hot water bath’ or double boiler, and it’s used for cooking custards, creating gentle, uniform heat around the food. Its creation is credited to the alchemist, Mary the Jewess. Pour boiling water into a larger baking dish and then place ring pan inside. Make sure water comes about halfway up the sides of the ring pan. If you don’t have enough boiling water, just add hot tap water instead, making sure to not splash any into the custard. Did you know that flans as well as cheesecakes fall into the category of custards?! How Do You Pronounce Brigadeirao? Here is one way to get close to the Portuguese pronunciation: if you say “bree-ga-day-ROWN” using rolled r’s. Even better, don’t actually touch the roof of your mouth or teeth with the tip of your tongue when it comes time for the N in ROWN– just bring it very close. Repeat several times and you’ll get the hang of it. 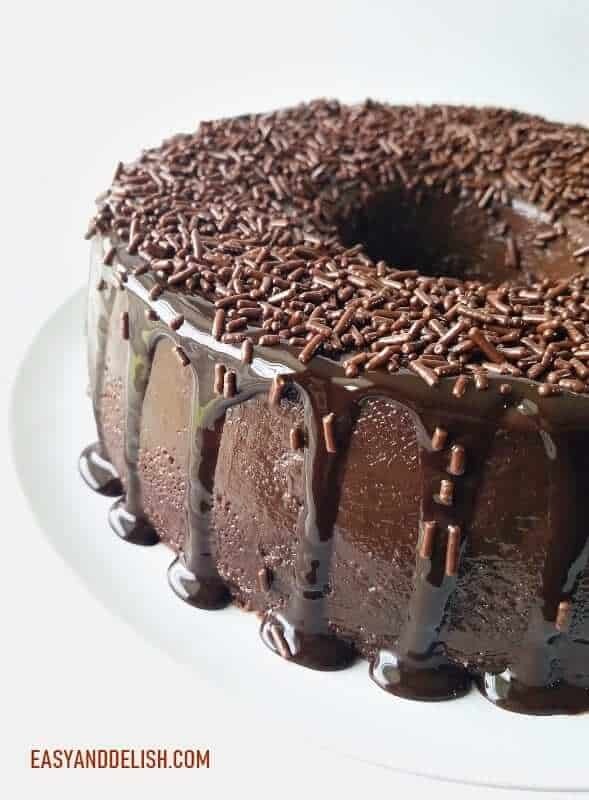 Or if you want, you could call this treat Big Brigadeiro or Giant Brigadeiro! It’s all good! Although there are variations, its main ingredients are sweetened condensed milk, milk, cocoa powder, eggs, sugar, and chocolate sprinkles. Store brigadeirao covered in the fridge for up to 5 days. Do not freeze! Why? This is a large flan and most flans don’t freeze well. Adjust your freezer to 0 degrees F and cut cool brigadeirao into quarters. Then, seal in freezer plastic bags for storing up to 1 month. Thaw in the fridge and serve. Serve brigadeirao all year round. It makes a great dessert for potlucks, get-together, Sunday meals as well as for Easter and Christmas depending on how you decorate it. 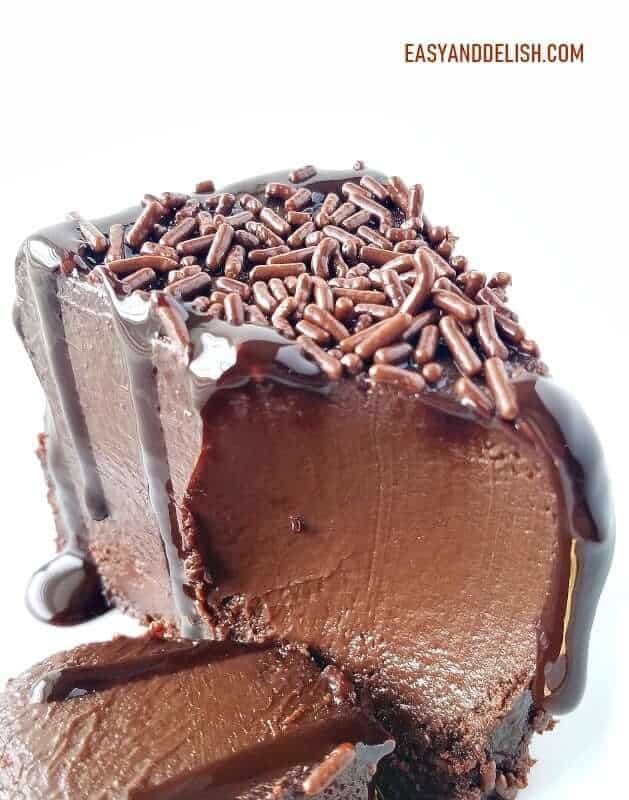 Brigadeirao is an easy family-size chocolate fudge flan made in the blender and baked in 40 minutes. It's decadent, fudgy, and addictive!!! Preheat the oven to 350º F (180º C). Grease a 8-inch (20 cm) ring pan with butter or no stick cooking spray. Sprinkle sugar all over. Set aside. Blend all ingredients (except the sprinkles.) in a blender until smooth. Pour mixture into the prepared pan. Bake in a bain-Marie for about 40 minutes. Remove from the oven, run a knife the edge around carefully, and place on a rack to cool. Cover and refrigerate for about at least 4 hours, or until chilled and set. Run a knife around again and invert onto a plate. You may have to tap bottom of the pan to encourage unmolding. Serve with chocolate sprinkles on top. 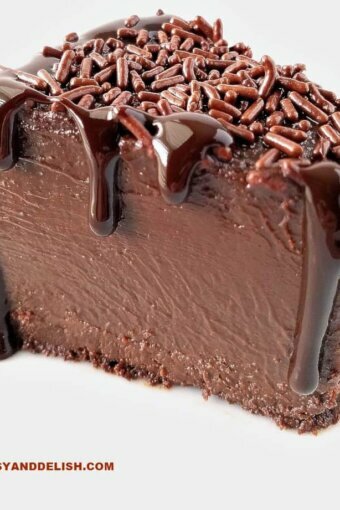 If desired, drizzle chocolate fudge on the edges. BAIN-MARIE: Place hot water in a large baking pan and place ring pan inside. Make sure water comes halfway up the side of the pan. Then, wrap in freezer plastic bags for storing up to 1 month. Serve brigadeirao all year round. It makes a great dessert for potlucks, get-togethers, or Sunday meals, as well as for Easter and Christmas, depending on how you decorate it. OMG…Brigadeirão…I have years without eating it, I just cannot remember when was the last time I had one. Everything that is made with chocolate can be my favorite, mine and my family’s. The tea party is so excited, look at the girls…!!! Of course, I can understand you, have your house with al that girls could be a little amazing…!!! Olá Denise, obrigada por visitar meu blog. Fiquei muito contente com seu comentário. Esse brigadeirão é dar água na boca. Suas receitas são maravilhosas! Adorei seu prestigio cheesecake. Obrigada, Luciana! Eu de vez em quando faço esse brigadeirão porque além de ser rápido, é realmente uma delícia. Aqui em casa nós amamos ele. Obrigada também por visitar o meu blog! I am officially craving chocolate now! Thanks, Laura! I am glad that you like my brigadeirão!!! Minha querida, è a primeira vez que entro no Seu site e que faço Brigadeirao. Morno quando EU resolving tentar desenformar e estava liquido por dentro e cozido por fora. O que EU faco? Cozinho mais um pouco e repito como a receita? A parte luquida eh normal? Desculpe mas eu só vi o seu comentário agora. Assim que sai do forno, você deixa esfriar na forma ã temperatura ambiente e depois põe na geladeira (ainda na forma) por pelo menos de 2 a 4 horas (ou mais). Somente quando o brigadeirão tiver gelado é que você desenforma com cuidado (passe uma faquinha nas beiradas da forma para soltar mas com cuidado), como instruído na receita. Isso não é feito um pudim de leite condensado que primeiro desenforma para gelar. Para o brigadeirão, primeiro gela e depois é que desenforma pois a consistência é de um fudge. Se você cozinhou no forno por 40 minutos a 180 graus C, o cozimento é suficiente sim mas não para desenformar ainda morno. Gele ele na forma e depois quando tiver bem geladinho, você desenforma com cuidado para não quebrar. Denise, eu vou salvar o seu site aqui. sempre eu tento fazer alguma coisa brasileira com a minha mulher, mas nunca sei direito como explicar as medidas. ela estava com vontade de comer brigadeirao mas moramos longe da loja brasilieira mais proxima. esse vai ser nosso santuario para receitas brasileiras. muito obrigado. Obrigada a voce por sua gentileza. Espero que voces experimentem e gostem. 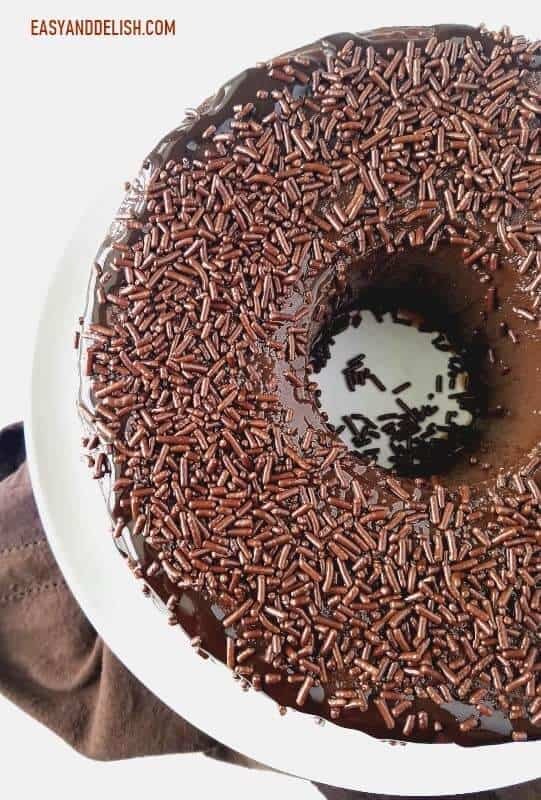 A minha familia eh louca por brigadeirao e tudo mais feito com brigadeiro. A qualquer tempo que voces tiverem alguma duvida sobre uma receita, substituicoes, medidas ou ingredientes, ficarei feliz em ajudar. Um abraco pra voces dois. Hi Denise! 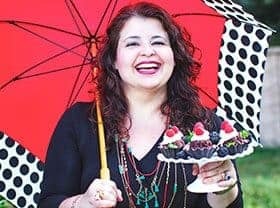 I am a fan & love all of your recipes! Question, what happened to the recipe instructions? The 1st step is to preheat oven & prepare pan. Then step 2 jumps straight to pour mixture into prepared pan. Do I just blend all the ingredients? And for how long? Please let me know-I intend to make this for my husband’s birthday on April 25th. Hi, Paula! Thank you so much for pointing out the missing blending step. I have just fixed the recipe to include that step. I apologize for it! I am quite sure I wrote that step but somehow it might have gotten deleted by mistake because I made several modifications in the original post. My husband and kids love this recipe which I made 3 times recently. LOL I hope your husband enjoys it. Wishing him a very happy yummy birthday! Hi, Paula! Thank you for pointing out the missing blending step which I have just fixed. I believe that step was accidentally deleted since I was greatly modifying that post to republish. My husband and kids are crazy for brigadeirao, which I made 3 times recently. I hope your husband enjoys it and wish him a very happy yummy birthday! Thanks for the pronunciation lesson. I think I’ll just call this good. 🙂 Thanks! Haha. That’s a good name too. Chocolate is always a hit! This brigadeirao would be fabulous at Easter Brunch! Am I in Heaven already ?